This is my second entry for the Unboxing from The Butterfly Project's 4th Birthday Celebration. 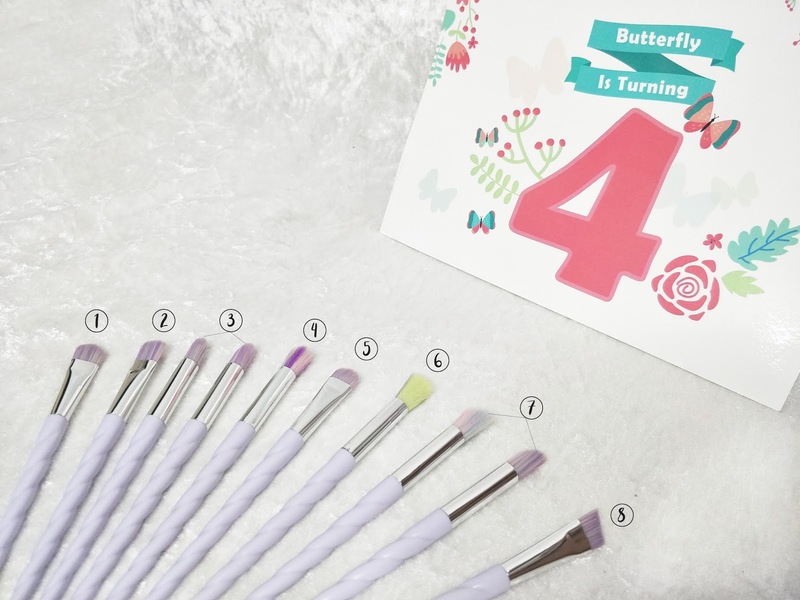 Now let's talk about the Unicorn Eye Makeup Brush from Wanderlust Things that most beauty gurus rave about! I am pretty sure I have only seen the ads on Facebook about this Unicorn Brushes but wasn't intrigued enough to click in and check it out. Call me a lone ranger, but I like what I like and don't really take interest of anything else unless I so happen to stumble upon it. First I thought it was just because of the word 'Unicorn' and the adorable colours that the brushes came with were the sole reason why girls were going head over heels for it. You know the whole "I am a unicorn" trend that has been going on...but boy was I wrong. After using 3 out of the 10 brushes that it came with, I completely understood the necessity of having proper brushes to do one's eye makeup. The eye makeup looked even more effortless and everything just blended in so well. I used No.1 to apply different colours on the whole eyelid , then used the No.3 to blend in later I used the No.8 to create the crease and angular edge. This was the perfectly blended outcome. Okay, it actually bugged me at first, like why would anyone need 10 brushes to do a simple eye makeup, right? You only have a pair of eyes. So, I did a little research and found out that all these different brushes played a different key role in creating those alluring/attractive eyes. 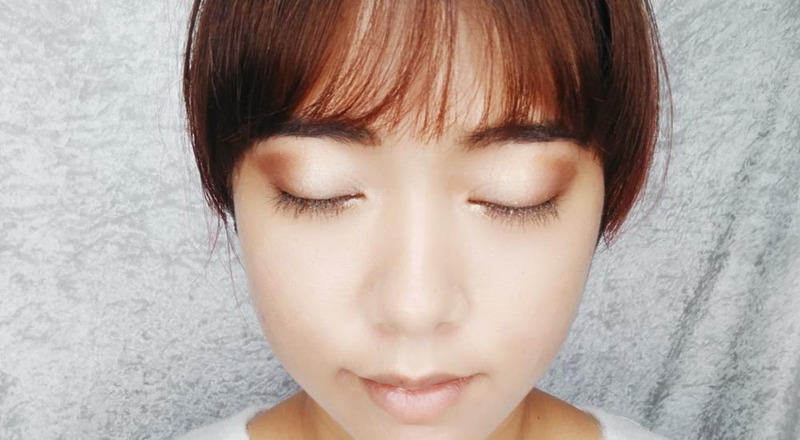 This is the basic of the basics when it comes to putting on eyeshadow as it can blend, create crease, and add highlight to brow bones with ease. I would love to think that this kind of brush is easy to use when you need to 'line' those colours up especially near your lash line and it also makes a good substitute for drawing your eyebrows. This two brushes are pretty similar and I figured that they work best in creating those 3D eye shapes. With it's soft bristles and rounded tip, you can easily add depth to your eyes. The rounded tip also makes it easier for you to precisely add colour to a specific spot on your eyelid. This two brushes are slightly different in terms of size and 'feather' but ultimately works the best for blending out edges and even to blend colours together so you don't end up looking like a work of Picasso, unless if that's the feel that you are going for. For all you beauty junkies who just love those smokey eyes this is the one brush that you all MUST have. This is the type of brush (according to a few online research) that works best to give you that smoking hot look. This is the Overall Fluff Brush's rival simply because it can cover a wider area during application and is even more precise with creating crease when compared. Need to cover a small area? Don't fret, the tip can easily get that task done for you. Obviously because of its flat-and-slanted angle tip getting those perfect cat-liners becomes so much more easy! With this brush, it's even more ideal to use it as a brow brush especially if you are into creating the "Kim Kardashian" look. Now that you know a little more about brushes, would you want to get your hands on this Wanderlust Things Unicorn Eye Makeup Brush? Oh! And don't worry no unicorns were harmed during the production period. To own one of this beautiful eye brush set CLICK HERE and just so you know it only costs RM89.00! That's like RM8.90 for each brush! Let me know what do you think of this brushes and if you have your own favourite brush sets in the comment box below. I am not into too much of makeup. But I do agree that good tools make it look beautiful. The unicorn brushes are so pretty! I want !!! I love the unicorn brush. Soft brush and the packaging is also. Glad I owe one of it. Always wanted to own a set of the unicorn brush. Seems like only Wonderlust sell it within my budget. The brush itself is lovely. I don't even wanna use it. Just wanna keep it as it is.